Venezuela is withdrawing its ambassador from neighbouring Colombia and freezing relations, following a dispute over weapons supplied to Colombian rebels. President Hugo Chavez, who announced the move on Venezuelan TV, also said he was halting trade deals with Colombia. The announcement came a day after the Colombia government said weapons bought by Venezuela from Sweden in the 1980s had ended up with Colombian guerrillas. Mr Chavez denied this and accused Colombia of acting "irresponsibly". "I've ordered to withdraw our ambassador from Bogota," the Venezuelan leader said on Tuesday. "We will freeze relations with Colombia," he added. As well as a diplomatic freeze, Mr Chavez warned trade relations would also be frozen and raised the possibility of expropriating Colombian companies. Venezuela, he said, would also substitute imports from Colombia - which currently account for about a third of the country's trade - with goods from other countries, notably Brazil and Ecuador. Bilateral trade between the two countries was set to run to some $5bn (£3bn) this year, according to the Venezuelan-Colombian Chamber of Economic Integration (Cavecol). Cavecol has appealed to both governments to conduct a "frank and sincere" dialogue and to maintain not only commercial but also "diplomatic, political and social ties," the Spanish news agency Efe reported. On Monday, the Colombian government said its troops had recovered Swedish anti-tank weapons in a raid on a camp run by the Marxist rebel Revolutionary Armed Forces of Colombia, or Farc. And at the weekend, Colombian President Alvaro Uribe said the Farc had obtained rocket-launchers on international arms markets. Mr Chavez, denying that Venezuela armed "any guerrilla group or armed group", accused Mr Uribe of behaving irresponsibly with his "unfounded" accusations. The Swedish authorities have launched an inquiry into how the Farc acquired the weapons. The guerrillas have been fighting the Bogota government since the 1960s. The BBC's Will Grant in Caracas said the dispute between the two neighbours comes as Colombia prepares to allow the US to use four of its military bases, a move which has angered Venezuela. Colombia says the accord will give the US military access to air bases to gather intelligence and support operations against drugs production and terrorism. 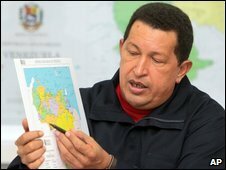 But Mr Chavez says it is part of an effort by Washington to turn Colombia into the "Israel of Latin America". Relations between the two South American nations have been difficult in recent years. 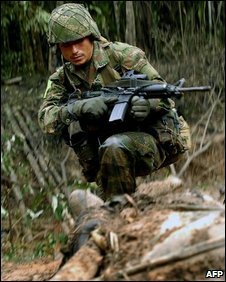 In March 2008, Venezuela moved troops to its border after Colombian forces raided a Farc camp just inside Ecuador. Both Ecuador and Venezuela cut off diplomatic ties with Colombia at the time, although Mr Chavez subsequently restored ties.